· A significant proportion of snakebites is said to be due to non- venomous snakes. Since the question of envenomation does not arise in such cases, systemic manifestations are non-existent, except those due to psychological shock. As a result of the fear and apprehension associated with snakes, every bite (venomous or otherwise) is attended by some degree of shock characterised by giddiness, syncope, sweating, palpitation, tachycardia, and hypotension. Consequent upon reassurance especially by a doctor, about the non-venomous nature of the bite, these symptoms usually resolve rapidly. It is well known that even when a highly venomous snake bites a human, serious envenomation may not occur. In fact, it has been suggested that 20 to 50% of venomous bites are not attended with serious toxicity. · Dry bite: A snake does not always inject venom at thetime of biting. · Protective gear: Envenomation may not occur in thecase of bites inflicted on shod feet or heavily clothed parts. · Leakage of venom: Head-on bites often result in effi-cient injection of venom, while sideswipes may cause some (or all) of the venom to escape outside the bitesite. · Superficial bite: Since humans do not constitute normalprey for most venomous snakes, they bite only to defend themselves before making a quick get-away. In such instances, the snake often deliberately does not bite deeply, but instead only strikes superficially, thereby conserving precious venom for its genuine prey. 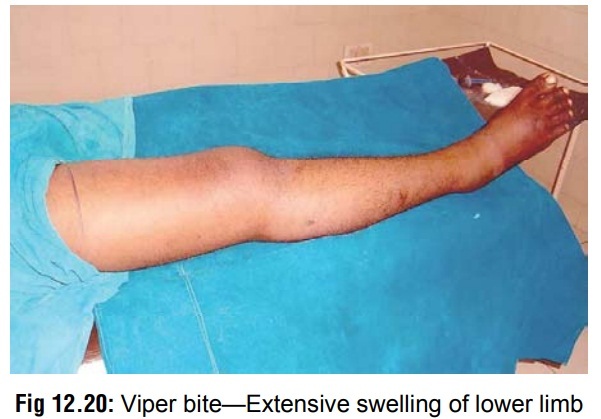 · Clinical effects of colubrid snakebite are generally localised, and comprise pain, oedema, erythema, ecchymosis and numbness, which resolve over one to two weeks. · Excessive salivation with metallic taste, and headache have also been reported. can occasionally cause significant local swelling, blistering, and regional lymphadenopathy. The lesion may emit a putrid smell, and break down with loss of skin and subcutaneous tissue (Fig 12.18). Elapid bites sometimes cause early onset of gangrene (of the wet type), while viperid bites progress more slowly, and the gangrene is usually of dry type. Secondary infections, e.g. tetanus, gas gangrene, etc. are relatively less common. · Systemic Effects: Neurotoxicity is the dominant clinical feature of elapid bites. Symptoms usually occur earlier (within 15 minutes to ½ hour) in cobra bite, while they are often delayed (up to several hours) in krait bite. · Hypersalivation (due to autonomic stimulation). · all become progressively flaccidly paralysed. Many patients find it difficult to open their mouths and speak. · Respiratory arrest may occur due to obstruction of upper airway by the paralysed tongue or inhaled vomitus, or due to paralysis of inter-costal muscles and diaphragm. Paradoxical respiration, as a result of the intercostal muscles becoming paralysed is said to be a frequent sign. · Although a patient appears unconscious, most are able to follow simple commands as noted by purposeful movement of the fingers or toes. Loss of consciousness and convulsions are terminal phenomena resulting from hypoxaemia. · Roughly half of patients bitten by Naja kaouthia (monocellate cobra) do not sustain enveno-mation. Local pain and swelling develops within 2 to 3 hours and becomes maximal in 24 to 48 hours. Blisters and skin discol-ouration may develop, and may be followed by necrosis of subcutaneous tissue with sloughing. Neurotoxicity, if it develops, generally begins 1 to 5 hours after envenomation, but may be delayed as long as 19 hours. Cranial nerve palsy is followed in some patients by generalised weakness and respiratory failure. · Renal complications are rare in elapid bites. · Although rarely reported in literature, disorders of platelet aggregation and coagulation-fibrinol-ysis system may occur after envenomation by cobras. Disseminated intravascular coagulation (DIC) may occur after bites by these snakes. · Coral snakes usually cause milder manifes-tations as compared to other elapids. Even substantial envenomation is associated with full recovery, following timely intervention. – Pitless as well as pit vipers cause marked local manifestations which develop rapidly, usually within ½ hour, but may occasionally be delayed for several hours. – Swelling first appears around the bitesite, and then spreads quickly to involve the whole limb (Fig12.20) and adjacent trunk. There is associatedpain, tenderness, and regional lymphadenopathy. Bruising is commonly seen over the path of super-ficial lymphatics and over regional lymph nodes. Persistent bleeding from bitesite is a constant feature. – Blisters begin to appear in about 12 hours in and around the bitesite, progressing subsequently to involve the entire limb. They may contain either clear or bloodstained fluid. In about 10 to 15% of the cases, extensive necrosis of skin, subcutaneous tissues, and muscles may occur. – Raised intracompartmental pressure adds to the problem in regions with tight fascial compartments such as anterior tibial compartment. This is charac-terised by severe pain, tense swelling, subcutaneous anaesthesia, and increased pain on stretching intra-compartmental muscles. – Haemostatic abnormalities are very characteristic of viperid bites. The first evidence of this is persistent bleeding from the bitesite. Haematuria may be seen within a few hours of the bite (Fig 12.21). Later gingival bleeding occurs (Fig 12.22), followed by epistaxis, haemoptysis (relatively rare), haemate-mesis (Fig 12.23), ecchymoses, intracranial and sub -conjuctival haemorrhages, and bleeding into the floor of the mouth, tympanic membrane, gastro-intestinal tract, and genito-urinary tract. Bleeding into anterior pituitary (causing a Sheehan-like syndrome) has been reported. Subarachnoid haem-orrhage manifests as severe headache and menin-gism, while intracerebral haemorrhage may cause hemiplegia, loss of consciousness, and convulsions. Retroperitoneal and intraperitoneal haemorrhages cause abdominal distension, tenderness, and peri-tonism, with signs of haemorrhagic shock. – Viperid envenomation is almost synonymous with incoagulable blood, which results from defibrina-tion. Intravascular haemolysis causing haemoglo-binuria and renal failure is a frequent occurrence, especially in bites by Russell’s viper. Acute renal failure is often associated with the presence of DIC which results in severe renal tubular and cortical necrosis with widespread microvascular fibrin deposition (microthrombi). It is suggested, however, that a direct toxic effect produced by the venom of Russell’s viper may produce renal damage. The hump-nosed pit viper can also cause renal failure, but the saw-scaled viper usually does not. – Hypotension is an important manifestation in all viper bites and is usually accompanied by tachy-cardia, unless the venom has affected the heart directly or reflexly, in which case the pulse may be slow or irregular. – A study on saw-scaled viper bites has indicated that haemorrhagic manifestations could more commonly be due to primary pathological fibrinolysis (PPF) than disseminated intravascular coagulation (DIC). The significance of this assertion is that adminis-tration of heparin which is the treatment of choice for DIC, may actually worsen the condition if it is due to PPF. – Cardiotoxicity (which may be seen in elapid bite also) produces a wide variety of ECG changes, as listed in Table 12.2. – It is important to note that ptosis and neurological symptoms may occur in the case of Russell’s viper bite (Fig 12.24), and every clinician must be alert to this possibility. Generalised flaccid paralysis can develop after envenomation. Neurotoxic effects are caused by the presence of phospholipases A2 with presynaptic neurotoxic activity. Conversely however, kraits and cobras do not cause coagula-tion abnormalities. Local Effects: Sea snakebites are well-known to produce minimal local effects. The bite itself is often painless and the victim may not even realise he has been bitten. However teeth are often left behind in the wound. Local swelling is negligible, and regional lymphadenitis usually does not occur. Fang marks may appear as one, two or more small circular dots, as though made by a pin or hypodermic needle. It is important to note that in some cases, there may be no clear fang marks, but a vague scratch mark, and yet serious poisoning may occur. – The dominant clinical feature is myalgia with stiff-ness and tenderness of muscles, which become apparent in ½ hour to 2 hours. This is due to rhabdo-myolysis, since hydrophid venom is predominantly myotoxic. Myoglobinaemia and myoglobinuria occur, resulting in acute tubular necrosis and renal failure. A “fixed” specific gravity of 1.010–1.013, together with a low urine volume output, myoglo-binuria, and progressively rising blood urea are indicative of impending acute renal failure in the setting of sea snake envenomation. – Trismus is an early feature. Passive stretching of muscles is painful. Later, flaccid paralysis develops, beginning with ptosis (as in elapid bite). – Hyperkalaemia may be present due to release of potassium from damaged muscles. This may be severe enough to cause cardiac arrest. Tall, peaked T waves and QRS prolongation suggest severe hyperkalaemia. – Other effects may include dizziness, nausea, vomiting, headache, and diaphoresis. – Neurotoxicity may include ptosis, ophthalmo-plegia, dysarthria, blurred or double vision, mydri-asis, inability to sit unassisted, depressed muscle stretch reflexes, and flaccid paralysis. In some cases, paralysis of respiratory muscles causes death due to respiratory failure. Consciousness is usually retained till the end. The fatality rate is estimated to be about 3%. Failing vision is considered to be a terminal sign.